So in early 2016, AMC decided against the upgrade as planned. Instead, we used this as an opportunity to have the technology investment address specific pain points and goals using the Scrum process. In the sport of rugby, the “scrum” formation involves teams packing closely together and working to gain possession of the ball. In the business world, Scrum is also a very team-based approach. Technology projects that use Scrum, for example, are not owned solely by IT. They take on a collaborative shape, encompassing multiple business units. As a [actor], I want [experience] so that [purpose]. As a member, I want to renew my membership in one click so that I don’t waste time. Story points are based on the Fibonacci sequence to help better determine the complexity of a project, rather than try to assign an hour or dollar estimate. This method allows us to arrive at a more accurate prediction of how long something will take from a development standpoint. The project team works on the user stories in an iterative fashion (e.g., 2-week “sprints”) for a predetermined period of time. Refinements and tweaks are made along the way based on the product owner’s feedback and team’s accomplishments. The project schedule is determined based on how fast the team completes the user stories in reality. The project ends when the required number of story points have been completed by the team. 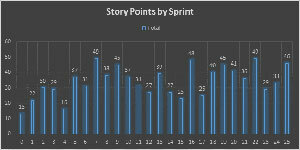 Number of Story Points for each sprint in the NANN optimization project. The yearlong optimization project was by no means a walk in the park. The Scrum process and the role of product owner was new to the organization, knowledge about business processes was distributed across the organization, and the technology stack had to be vastly improved. However, with strong commitment from the team, the project produced a number of successes. The customer/member portal now features a fully modern, mobile-enabled customer experience for NANN customers and members. Workflow, renewal, etc., are all mobile now. It is a night-and-day user experience. Regarding internal business processes, asking the right questions ahead of time led to cost reductions. As seen in one example, in the old version of Personify, customization handled prorating secondary memberships. The team determined that carrying this through to the new version would have been a five-figure investment—and the customization wouldn’t bring in nearly enough revenue. In response, an alternative method was derived, saving thousands of dollars. The Scrum project also brought a broad benefit to AMC: the organization can now use what it learned from the process to serve the rest of AMC’s full service clients. With the lessons learned from the Personify Scrum optimization, AMC will now turn to other associations it manages. Those that share many characteristics with NANN (healthcare focus, hosts a conference, produces digital products, etc.) may only need a few tweaks to their Personify optimization. Other clients may require more effort. But iteratively, AMC will be refining a digital experience that better serves the customers and members of the associations it manages. Perhaps the most satisfying takeaway from the Personify optimization project was an intangible benefit: People felt good to be part of the project. Different parts of the team found a new sense of joint ownership. Business teams are now more aware of how IT functions and the challenges faced, and IT better understands the business perspective. Most importantly, the Scrum process encourages collaboration and helps build relationships for future work.